The PCB has no part number and the inferred URL isn’t productive. The “driver CD” accompanying it has doc for every possible board the vendor might sell and, absent a part number, the file names aren’t helpful. An exhaustive search suggests it corresponds to the HY-JK02-M 5-axis interface board manual.doc file. 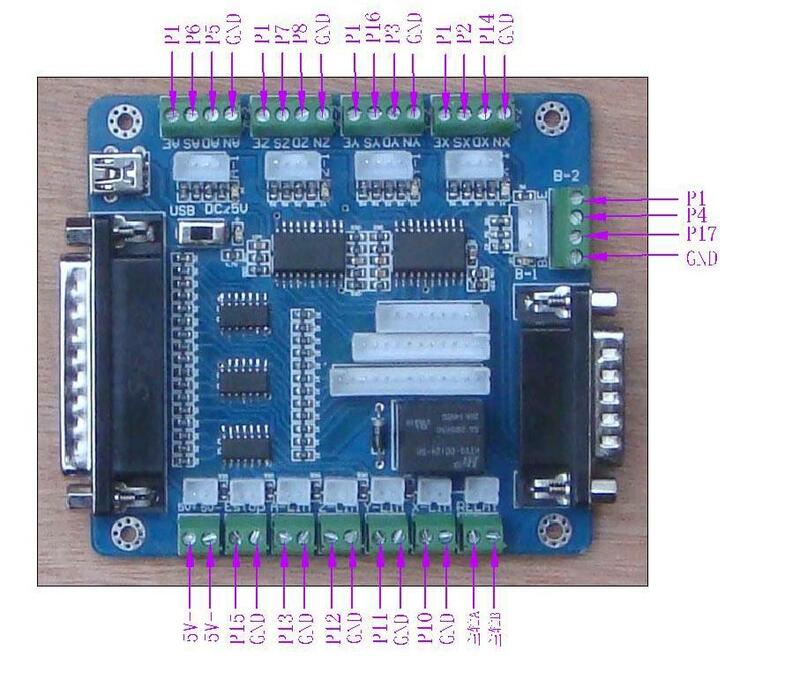 Despite any implication to the contrary, the board does not have optoisolators between the parallel port pins and the outside world. 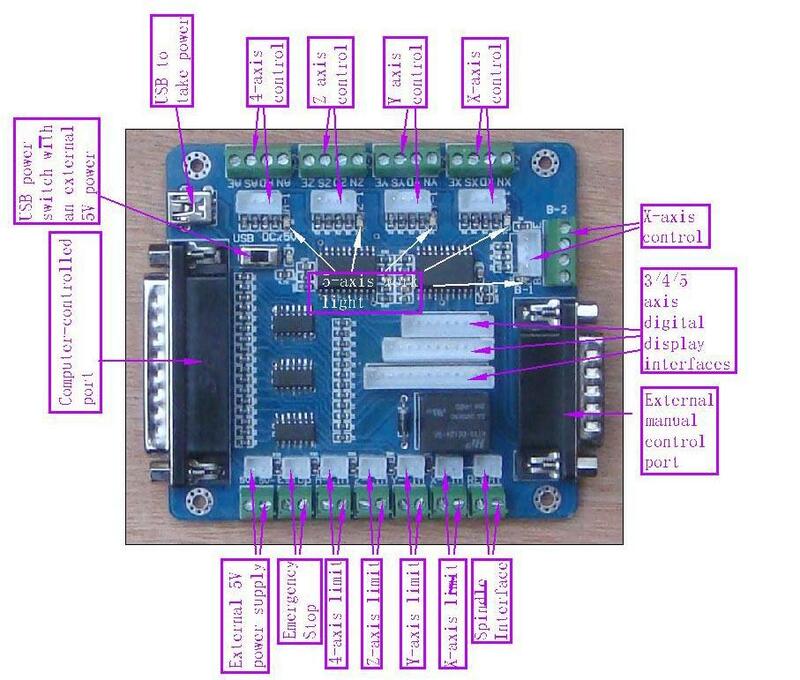 The stepper driver bricks should, but the input signals from limit switches and suchlike connect directly to the guts of your PC. It looks like the board I got added a spindle relay driver transistor, plus a few resistors over by the manual control connector on the right. Notice that the fourth terminal on each axis is GND, not the positive supply required for the optoisolators on the 2M415-oid driver bricks, which means you can’t just run a section of ribbon cable from the breakout board to the brick. You’ll need a separate +5 V (or whatever) power supply wire for each brick, with a common return to the system ground for this board. Those terminals are firmly bonded to the top and bottom ground planes on the board, so there’s no practical way to re-route them. 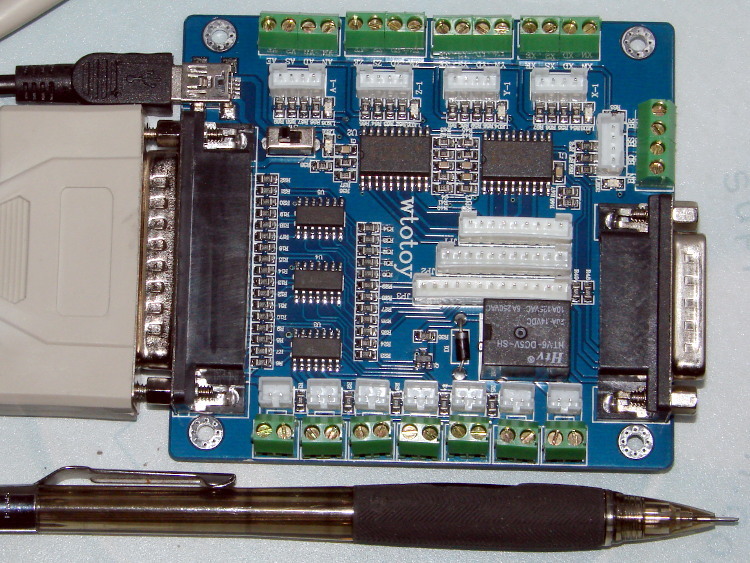 The small switch in the upper left, just to the right of the parallel port connector, selects +5 V power from the USB port (which has no data lines) or the power connector in the lower left. The LED near the switch won’t light up until you have both the parallel port cable and the USB cable plugged in. The doc includes a timing diagram with no numeric values. I established that it can’t keep up with a 500 kHz pulse train and seems content at 100 kHz, but that’s conjecture. Setting the timing to match whatever the stepper driver bricks prefer will probably work. The diagram suggests the setup and hold times for direction changes are whatever you use for the minimum time between step pulses. The table uses Chinese for Pin 15: 急停. The three white connectors in the middle drive an LED readout board that’s probably most useful as a DRO for CNC-converted manual mills using the pendant for positioning. The small white connectors duplicate the functions of the green screw terminals. They’re probably useful in a small machine that I’m not building. This isn’t the board I intend to use in the final setup, because I need far more I/O pins, but it’ll serve for the short term.